Newman, Kim. Anno Dracula . Carroll & Graf 1993. What if: Dracula actually existed, defeated Van Helsing, and married the widowed Queen Victoria. Series note: Series including the novels, Anno Dracula , The Bloody Red Baron Judgment of Tears: Anno Dracula 1959 , Anno Dracula: One Thousand Monsters and the forthconing Anno Dracula: Daikaiju , plus stories and novellas "Yokai Town", "Vampire Romance", "Promises to Keep" "Aquarius", "Coppola's Dracula", "Andy Warhol's Dracula", "Castle in the Desert", "Who Dares Wins", "The Other Side of Midnight", "You Are the Wind Beneath My Wings", "You'll Never Drink Blood in This Town Again", "Miss Baltimore Crabs", "A Concert for Transylvania", "Dr. Pretorius and Mr. Hyde", "Charles's Angels". The short works except "Yokai Town", "Vampire Romance", and "Aquarius" are assembled as the "fix-up" novel Anno Dracula: Johnny Alucard . Comments: The stories progressively become less allohistorical and more fantastiscal spins of actual history. The first two novels include the most radical differences from our world. Newman, Kim. Anno Dracula . Translated to the French as Anno Dracula , J'ai lu 1998. Newman, Kim. Anno Dracula . Translated to the German as Anno Dracula , Heyne 1998. Newman, Kim. Anno Dracula . Titan 2011. Summary: A human agent of the Diogenes Club and a vampire are among those hunting for Jack the Ripper, who is killing vampire whores. Series note: First of the Anni Draculae novels. Comments: The 2011 Titan edition includes an added afterword and alternative endings. — As Anno-Dracula , Carroll & Graf 1993 (0881849677BUY). — Expanded from "Red Reign", in The Mammoth Book of Vampires (ed. Stephen Jones), Robinson 1992 (1854871080), 2004 (1841199265), Carroll & Graf 1992 (0881847968BUY) 2003 (0739450514), Running Press (0786713720BUY); rev. Best New Horror 4 (eds. Stephen Jones and Ramsey Campbell), Carroll & Graf 1993 (0786700041), Robinson 1993; The Giant Book of Terror (eds. Stephen Jones and Ramsey Campbell), Magpie 1994 (1854873768), Parragon 1994 (0757501429); and Rivals of Dracula (eds. Robert Weinberg, Stefan R. Dziemianowicz and Martin H. Greenberg), Barnes & Noble 1996 (076070175X). Translation: French by Thierry Arson as Anno Dracula , J'ai lu 1998 (2290049662). Translation: German of "Red Reign" as "[[title unknown]]", in Das große Horror-Lesebuch III (ed. Robert Vito), Goldmann 1994 (3442423953). Translation: German by Thomas Mohr as Anno Dracula , Haffmans 1994 (3251002597). Translation: German by Walter Brumm as Anno Dracula , Heyne 1998 (3453130987). 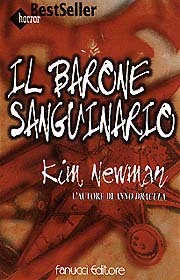 Translation: Italian by Bernardo Cicchetti as Anno Dracula: romanzo , Fanucci 1995 (8834704428), 1997 (8834705580), 2003 (8834704428). Translation: Italian of "Red Reign" by Sofia Mohamed as "Il regno scarlatto", in Horror: Il meglio (eds. Stephen Jones and Ramsey Campbell), Nord 1994 (8842908002). Translation: Italian of "Red Reign" by Gianni Pilo as "Il regno rosso", in Vampiri! (ed. Stephen Jones) Newton & Compton 1994 (8881838001). Translation: Japanese by Yasuko Kajimoto as Dorakyura Norimoto , Tokyo Sogen 1995 (448857601X). Translation: Polish by Dariusz Kopocinski as Anno Dracula , Prószynski I S-ka 1998 (8371805306). Translation: Serbian by Aleksandar Marković as Anno Drakula , Editor 2002 (8683591417). Translation: Spanish by Jaume de Marcos Andreu as El Año de Drácula , Timun Mas 1994 (8448042018), 1999 (8448042077). Awards: Nominee: 1993 World Fantasy Award for best novel. Newman, Kim. "Yokai Town: Anno Dracula 1899"
Summary: Precursor to the novels Anno Dracula: One Thousand Monsters and Anno Dracula: Daikaju . Series note: A story in the Anni Draculae cycle. Published: In Anno Dracula 1899 and Other Stories , Titan 2017 (178116570XBUY). Series note: A novel in the Anni Draculae cycle. Published: Titan 2017 (1781165637BUY), 2018 (1781165653BUY). Newman, Kim. The Bloody Red Baron . Carroll & Graf 1995. Newman, Kim. The Bloody Red Baron . Translated to the Italian as Il Barone sanguinario , Fanucci 1998. Newman, Kim. The Bloody Red Baron . Translated to the French as Le baron rourge sang , J'ai lu 1998. Newman, Kim. The Bloody Red Baron . Titan 2012. Summary: Thirty years after being kicked out of England, Graf von Dracula now controls imperial Germany and has led Europe into bloody war. On the Western Front, the war in the air becomes increasingly bizarre. Series note: Second of the Anni Draculae novels. Published: Carroll & Graf 1995 (0786702524BUY); SFBC 1996; Simon & Schuster UK 1996 (0684817446); Avon/AvoNova 1997 (0380727145BUY); Pocket UK 1997 (0671854518BUY); and exp. Titan 2012 (0857680846BUY), 2017 (1785655493BUY). Publication note: The 2012 Titan edition includes the additional novella "Vampire Romance". 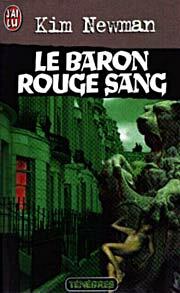 Translation: French by Thierry Arson as Le Baron rouge sang , J'ai lu 1999 (2290050903). Translation: German of an excerpt as "Herr Poe, Herr Kafka und Herr Ewers", in Der Rabe , [[publ. unknown]]. Translation: German by Thomas Mohr as Der rote Baron , Haffmans 1999 (3251301144). Translation: Italian by Bernardo Cicchetti as Il barone sanguinario , Fanucci 1998 (8834705858), 2005 (8834705858). Translation: Japanese by Yasuko Kajimoto as Dorakyura Ikusaki , Tokyo Sogen 1998 (4488576028). Translation: Polish by Dariusz Kopocinski as Krwawy baron , Prószynski I S-ka 1999 (8371803028). Translation: Serbian by Magdalena Reljić as Krvavo crveni baron , Editor 2003 (8677100024). Translation: Spanish by Hernán Sabaté as El Sanguinario Barón Rojo , Timun Mas 1997 (8448042026), 2000 (8448042085). Awards: Honorable mention: 1995 Sidewise Award for best long-form alternate history. Published: Included in The Bloody Red Baron , Titan 2012 (0857680846BUY). — Excerpt "Geneviève Bobs Her Hair: Anno Dracula 1923" was posted on the author's Facebook page in September 2011 and on the author's website, date unknown. 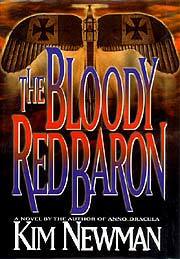 Publication note: This novella appears in just the one edition of The Bloody Red Baron . Newman, Kim. 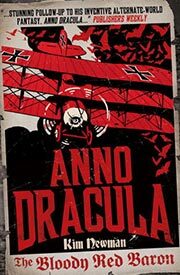 "Promises to Keep: Anno Dracula 1944"
Summary: Intro to Johnny Alucard that provides a brief account of the origin of Dracula's last spawn. 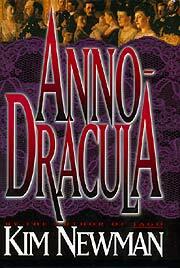 Published: In Anno Dracula: Johnny Alucard , Titan 2013 (0857680862BUY). Newman, Kim. Judgment of Tears: Anno Dracula 1959 . Carroll & Graf 1998. Newman, Kim. Dracula Cha Cha Cha . Titan 2012. Summary: In 1959, the elder vampires gather in Rome for the wedding of Dracula, but there they find themselves the targets of a mysterious vampire killer. Series note: Third of the Anni Draculae novels. 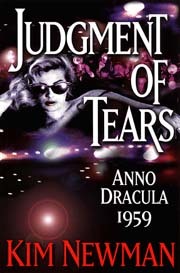 Published: As Judgment of Tears: Anno Dracula 1959 , Carrol & Graf 1998 (0786705582BUY); Avon 1999 (0380732297BUY). Published: As Dracula Cha Cha Cha , Simon & Schuster UK 2000 (0684851830); Pocket UK 2000 (0671022091); Titan 2012 (0857680854BUY). 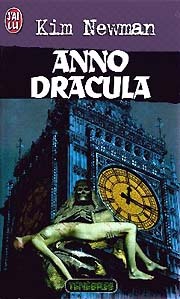 Publication note: The 2012 Titan edition includes the novella "Aquarius: Anno Dracula 1968", q.v. Translation: French by Thierry Arson Le jugement des larmes , J'ai lu 2000 (2290300438). Translation: Japanese by Yasuko Kajimoto as Dorakyura Hougyo , Tokyo Sogen 2002 (4488576036). Newman, Kim. 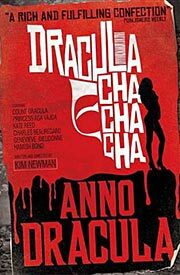 "Aquarius: Anno Dracula 1968"
Published: Included in Dracula Cha Cha Cha , Titan 2012 (0857680854BUY). Publication note: This novella appears in just the one edition of Dracula Cha Cha Cha . An early draft appeared on the author's Facebook page in February 2012. Newman, Kim. "Coppola's Dracula: Anno Dracula 1976-1977"
Summary: In the late 1970s Francis Ford Coppola's production of Dracula , shot on location in Transylvania and featuring Marlon Brando in the title role, becomes an exercise in perseverance and even madness to complete. Series note: A novella in the Anni Draculae cycle. Published: In The Mammoth Book of Dracula (ed. Stephen Jones), Robinson 1997 (1854875205), Carroll & Graf 1997 (0786704284BUY); Vampires: Encounters With the Undead (ed. David Skai), Black Dog & Leventhal 2001 (1579122094); and rev. Anno Dracula: Johnny Alucard , Titan 2013 (0857680862BUY). Published: On-line at infinity plus , March 1998. Translation: French as "Apocalypse Dracula", in Ténègbres #3 (July 1998). Translation: Italian by Gianni Pilo as "Il 'Dracul'" di Coppola", in Il grande libro di Dracula (ed. Stephen Jones), Newton & Compton 2000 (8882893286). Awards: Nominee: 1998 World Fantasy Award for best novella. Newman, Kim. "Castle in the Desert: Anno Dracula 1977"
Summary: An aged Los Angeles detective's ex-wife is murdered and he searches for her missing daughter. Published: Posted on-line at SciFiction June 14, 2000; and on the author's website, date unknown, but removed some years later. Published: In rev. Anno Dracula: Johnny Alucard , Titan 2013 (0857680862BUY). Newman, Kim. "Andy Warhol's Dracula: Anno Dracula 1978-1979"
Summary: Johnny Pop, a Romanian vampire newly arrived in New York City in the late 1970s, becomes a member of the club scene, and a dealer of the highly-addictive "drac". Published: Posted on-line at Event Horizon , Jun. 15, 1999. Published: In Andy Warhol's Dracula , PS 1999 (1902880048BUY); Binary 2 , Millennium 2000 (1857987608BUY); and rev. Anno Dracula: Johnny Alucard , Titan 2013 (0857680862BUY). Translation: French by Melanie Fazi as "Andy Warhol's Dracula", in Faux revuer , Bragelonne 2002 (2914370156). Newman, Kim. 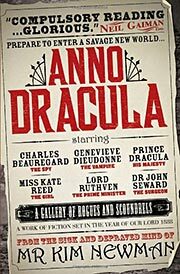 "Who Dares Wins: Anno Dracula 1980"
Summary: Vampires of the "Transylvania Movement" take over the Romanian embassy in London. Published: Posted on-line on the author's website, JohnnyAlucard.com, June 2002, but removed several years later. Newman, Kim. "The Other Side of Midnight: Anno Dracula 1981"
Summary: Orson Welles receives funding from a mysterious source to film the ultimate version of Dracula , and hires a private detective to find out why. Published: In The Vampire Sextette (ed. Marvin Kaye), SFBC 2000, Ace 2002 (0441009867BUY); and rev. Anno Dracula: Johnny Alucard , Titan 2013 (0857680862BUY). Awards: Finalist: 2000 Sidewise Award for best short-form alternate history. Newman, Kim. "You Are the Wind Beneath My Wings: Anno Dracula 1986"
Summary: The tale of a covert operation training vampire agents to unseat the Ceaucescu regime in Romania. Published: In Horror Garage #3 (2001); and rev. Anno Dracula: Johnny Alucard , Titan 2013 (0857680862BUY). Newman, Kim. 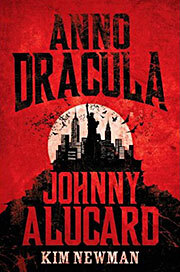 "You'll Never Drink Blood in This Town Again: Anno-Dracula 1990"
Series note: A story in the Anni Draculae cycle, first published as a chapter in the fix-up novel Johnny Alucard . Newman, Kim. 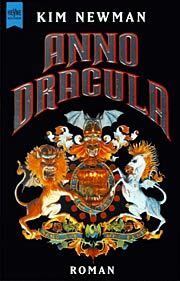 "Miss Baltimore Crabs: Anno-Dracula 1990"
Series note: A story in the Anni Draculae cycle, first published as an intersticial chapter in the fix-up novel Johnny Alucard . Newman, Kim. "A Concert for Transylvania, Anno Dracula 1990"
Published: Partial (?) draft posted on the author's Facebook page in June 2011, and also on the author's website, date unknown. Newman, Kim. "Dr. Pretorius and Mr. Hyde: Anno-Dracula 1991"
Series note: A story in the Anni Draculae cycle, first published as an interstitial chapter in the fix-up novel Johnny Alucard . Newman, Kim. "Charles's Angels: Anno-Dracula 1991"
Published: Not yet published; expected from Titan in October 2019 (1785658867BUY). Newman, Kim. Anno Dracula: Johnny Alucard . Titan UK 2013. Summary: "Fix-up" novel of stories and novellas generally on the theme of the arrival and effects of vampires in America, and some specifically about Dracula's last "get" and his effort to become the new King of the Cats. The works included are "Promises to Keep", "Coppola's Dracula", "Andy Warhol's Dracula", "Castle in the Desert", "Who Dares Wins", "The Other Side of Midnight", "You Are the Wind Beneath My Wings", "You'll Never Drink Blood in This Town Again", "Miss Baltimore Crabs", "A Concert for Transylvania", "Dr. Pretorius and Mr. Hyde", and "Charles's Angels", all q.v. Series note: Collection of stories in the Anni Draculae cycle. Published: Titan UK 2013 (0857680862BUY).